Originally uploaded by Hot Grill. 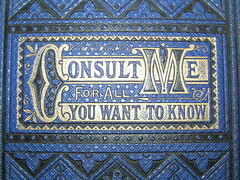 I’ve just started a new site, essentially plagiarising this amazing book from 1866 I found in Bakewell market “Consult Me For All You Want To Know.” With information ranging from how to select meat, to cures for cancer, to explosive compounds, it’s amazing. Have a read.